Conscious that all new things arise from the mystery of creation as Gorki list is for more than half a century at the centre of such process, we encourage and uphold “One and Only” values. GORKI LIST CREATIVITY AWARD is given to the most original creative work in the calendar year. The award is given in the form of a distinct statuette and pre-specified financial grant. The award can be given to one or maximum five creative works which have left a strong impression that year. Main idea is for the work to be the one that improves the cultural scene and creates the circumstances for further cultural development. With his roles in the movie „Trap“and in the play „Huddersfield“ Glogovac made exceptional creative impact. Giving his own seal to these roles, (in both cases leading roles but diametrically opposed in their nature) and bringing his performance to masterly heights, he managed to accentuate the messages, very appropriate for the times and utterly humane. In the movie„Trap“he candidly paints the „crossroads“and articulates readiness of man to suffer greatly for the good of those that are close to him. With strong emotions and authenticity in all of his performances, Nebojša Glogovac, among other things, sets whole new criteria for the art of acting. Influential artist, whose rock and roll workshop produces eagerly, awaited innovative songs. This year, form Koja’s „workshop“we got an excellent album, in Serbian language, titled “When you say music, what exactly do you mean, please tell me?”. Discipline in its true form. Noisy, true to itself, innovative, yet bluntly honest. Without compromise, pretence or unnecessary fuss. In line with the cultural and thought-through resistance as a mean of expression of his band “Disciplina kičme”. A band popular in Britain which does not cash on the fact, because they consider music business in Britain to be unwilling to allow individual actions of merging genres which seemingly do not touch, namely, rock and dance music, and that was the pioneering work of the band. Koja is the author of music for the films: „Promising lad“, „Beautiful women walking through the city“a „The way rock’n’roll tumbled-down “. Certainly one of the most inventive and imaginative creators of fashion in Serbia. Her clever and playful creations constantly remind us of her fine-art roots. She comprehends fashion as “space” in which she can artistically express herself and her individuality. Her latest collection “Sugary hiccup”, which was her fifth presentation at the BFW in October 2007, marks her major artistic rise. It is her first collection for men, for the Autumn/Winter 2007/08. Application of animal prints which Ana personally created for this collection, is an indication of her further original artistic development. As a person who truly appreciates animals and is against animal cruelty, she never uses fur or leather, so this was a perfect way to express her ethical standpoint. Raša Popov, authentic wise man, writer, seasoned TV reporter and journalist writing for Kikinda Daily. He had always devoted himself fully to everything that touched him, where others have seen just an empty, dull space, he always managed to find something of interest, but also encouraged others to do so, to discover virtue and take a stand against hypocrisy, boredom and grouchiness, lies and prejudice, deceit and worthlessness. In the true meaning of the word – he always tried to demystify, refresh and to prove his point, to create new literary work and enrich the world with it… Those aspirations are clearly seen in his books of poetry: „Two eyes“, „Iron donkey“, „Toad who wouldn’t keep quiet“, „Rotting head“, in his plays: „Wardrobe of historic significance“and „New man at the flower square“, and in his introductions written for the Pčese books. Rasa Popov is one of the writers with a unique gift for innovation, always unpredictable and able to demonstrate his forethought with his writing. One of very few personalities with an impact of renaissance proportions: he is a graphic artist, designer, cartoonist, musician, educator at the Faculty of Applied Arts, author of several books. Picture books are a part of his life ever since he was a boy. Illustration became a connecting point in everything he does, it transcends all media. He devoted his music album „Tree Rubber Soul Project“ to the „Beatles “, and in his truly original way, marked the 27th anniversary of Lennon’s death by playing in Liverpool this year. Any project Rastko Ciric undertakes creates an intelligent merriment, including his widely acclaimed invisible drawings. Two years after its world premiere in Venice, Belgrade public had the opportunity to hear for the first time at Bemus, work by Isidora Zebeljan „The Horses of St. Marc“, performed by Belgrade Philharmonic. Since Isidora Žebeljan was awarded „Genesis“ prize by London Foundation four years ago, she has found her place on European music scene. Her opera „Zora D.“, directed by renowned David Pauntny, was performed in Amsterdam and Vienna, also, she composed „The Song of a Traveller in the Night,“ especially for „The Academy of St. Martin in the Fields“ which is a part of their regular repertoire. This is a story told in a manner of a journal, written by the central character, who during „Milosevic“years won a scholarship for one month residence in a luxury villa by Italian Lake Como. Valjarevic’ modern sensibility, simple way of expression and directness of relaying his philosophical thought and political and artistic views, makes readers into interlocutors, even holders of the same views who recognise the situations and emotions that arise. The retrospective exhibition of this artist presented at the Belgrade Museum of Modern Art, confirmed that paintings by Bora Iljovski use the language of abstraction as means of transformation of artist’s experiences into sensations of colouristic – linear game play, “jazzed-up”, visual rhythmic. Even though they stylistically belong to „high modernism“, they are closer to child’s play than to overly serious and ceremonial works of art. Behind each and every one of those paintings there stands thoughtful and methodical work, yet they appeal to viewers with their lightness and certain dose humour which is quite often lacking in abstract art. With just a small number of theatre seasons behind her, Milena Markovic managed to become an uncompromising, authentic playwright, noted for her unusual, poetic, sometimes bitterly honest plays, performed in leading theatres throughout Serbia and abroad. „The ship for dolls“, her latest play, presents her amazing talent for writing but also her call for kindness as a woman and as human being. 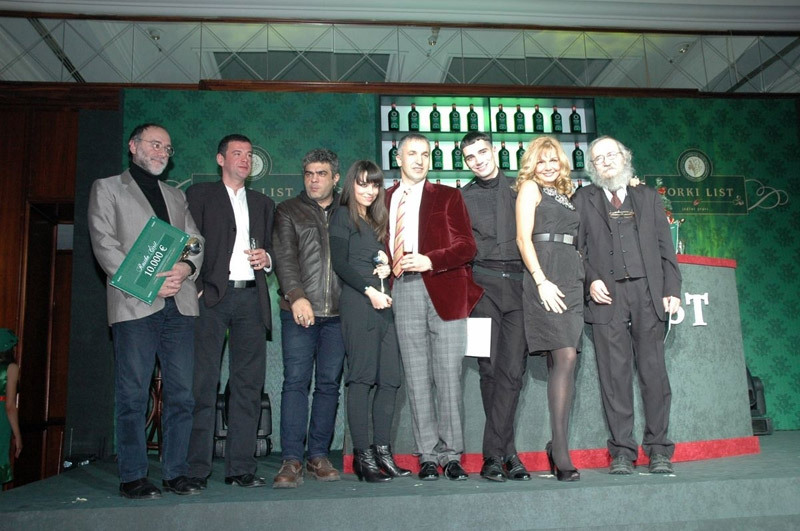 – For exceptional design of the bottle of Gorki List for which he won an award in Cannes this year …… Mr. Branko Lukić. – For visualisation of Gorki List, photographer and Orange Studio Director ….Mr. Nebojsa Babic. – For direction of the promotional spot “The one and only” …. Mr.Milos Djukelic.